AQ1200L - G & W Machinery Sales, Inc. 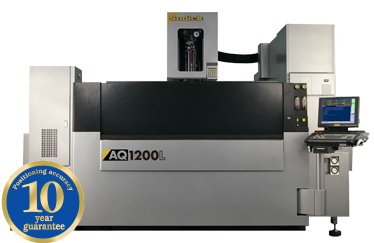 The AQ1200L is Sodick’s largest Wire EDM and features Sodick’s Linear Motor Technology. The AQ1200L features a direct-drive, frictionless, vibration-free mechanism that has unrivaled acceleration and positioning accuracy with no backlash. Sodick’s Linear Motor Driven Wire EDMs have no backlash and are vibration-free, this results in machining accuracy combined with a fine surface finish. Sodick’s AQ1200L Wire EDM features linear motor drive technology; this guarantees machining accuracy since linear motors never wear. Linear motors provide smooth, vibration-free table movement. Backlash is completely eliminated since there are no ball-screws or couplings. With the use of linear glass scales in the X, Y, U and V axes, precision positioning accuracy with direct feedback is accomplished. This allows for unmatched straight and taper cutting accuracy. The longevity of this system is unmatched by anyone in the industry – and comes backed with a 10-Year Positioning Guarantee. The newly developed LN2WH power supply unit is featured on the AQ1200L Wire EDM and utilizes “Perfect Active Control” technology. It also uses 1 Gbit/sec serial communication technology featuring high-speed processing of the discharge control and motion control in a simultaneous process. The AQ Series features energy-saving designs and technologies. Compared to conventional Wire EDMs, the Sodick Wire EDM Range can reduce average energy consumption by up to 60% by recycling unused discharge pulses that were not originally used in the discharge process. Included is a one-sided automated vertical sliding machining tank, a U-shaped workstand along with other features that increase workability during set-up. The ergonomic control pendant is on an adjustable mounting enabling all the work to be performed from the front of the machine.